Background: The risk of serious harm from chest drains is unknown. The UK National Patient Safety Agency (NPSA) reported 12 deaths and 15 cases of serious harm from chest drains between 2005 and 2008 (http://www.npsa.nhs.uk/). The aim of this survey was to determine which major complications have been encountered by chest physicians in UK hospitals and which training and patient safety measures are currently in place. Method: A questionnaire was sent to 197 respiratory consultants at 148 acute hospital trusts to enquire about current practice at each trust and any major adverse incidents related to chest drains in the past 5 years (2003–8). Results: Colleagues from 99 trusts replied. 65 trusts reported at least one major incident involving ICD insertion. 24 trusts reported at least one case of misplacement of a chest drain (total 31 cases with seven deaths). Misplaced drains were inserted in liver (10), peritoneal space (6), heart (5), spleen (5), subclavian vessels (2), colon (1), oesophagus (1) and inferior vena cava (1). Thirty trusts reported serious lung or chest wall injuries affecting 47 patients with eight deaths. Five trusts reported a total of six cases of ICD placement on the wrong side with two deaths. The guide wire was lost in the pleural cavity in three cases. 22 of 99 trusts require written consent from the patient before ICD insertion, 11 trusts have a training policy including supervision and formal instruction for trainee operators and 16 trusts have patient information literature for this procedure. The seniority of doctors permitted to insert ICD at the 99 trusts is as follows: 30% foundation year (FY) 1 doctors and above; 26% FY 2 doctors and above; 30% specialist trainees (ST1) and above; 13% specialist registrars, (or equivalent ST in year 3/4/5) or hospital specialist or consultants only. Conclusions: 65% of responding trusts have encountered major complications of chest drains with 17 fatal cases reported in this survey. ICD are inserted by junior trainees, often without formal training, written consent or written patient information. The BTS Standards of Care Committee is assisting the NPSA with plans to reduce these risks. Background: Asthma, chronic bronchitis and emphysema represent an overlapping group of disorders of airways obstruction. The current definitions of these disorders may not adequately reflect distinct phenotypes with differing pathogenesis, disease processes, clinical features or responses to treatment. Methods: A random population sample of 3500 adults aged 25–75 years from an urban population underwent detailed investigation including an interviewer-administered written questionnaire, pulmonary function tests, FENO measurements, blood tests and chest computed tomography scans. A cluster analysis was undertaken in the subgroup with current respiratory symptoms or lung function tests indicating the presence of airflow obstruction (post-bronchodilator FEV1/FVC <0.7). Cluster analysis was carried out using nine variables: (1) pre-bronchodilator FEV1/FVC ratio expressed as a percentage; (2) pre-bronchodilator FEV1 expressed as a percentage predicted; (3) post-bronchodilator change in FEV1, expressed as a percentage from baseline; (4) functional residual capacity (FRC) expressed as a percentage of predicted; (5) DLCO/VA adjusted for haemoglobin expressed as percentage predicted; (6) natural logarithm of the serum IgE concentration; (7) mean exhaled nitric oxide (FENO); (8) sputum production defined as a positive response to the question “Do you usually bring up sputum from your chest or have sputum in your chest that is difficult to bring up when you don’t have a cold?”; (9) pack-years of tobacco cigarette consumption. Results: 175 subjects with a complete dataset were included in the cluster analysis. Five distinct clusters were identified, based on the nine variables included in the model. Cluster 1 grouped subjects with severe and markedly variable airflow obstruction in an overlap syndrome with features of atopic asthma, chronic bronchitis and emphysema; cluster 2 grouped subjects with features of emphysema without concomitant chronic bronchitis or asthma; cluster 3 represented atopic asthma with eosinophilic airways inflammation; cluster 4 represented mild airflow obstruction without other dominant phenotypic features; cluster 5 represented chronic bronchitis in non-smokers (see table). Conclusions: Five distinct phenotypes of airflow obstruction were identified in adults derived from a random population sample. If these findings are confirmed in other populations, then they may form the basis of a modified taxonomy for the disorders of airways obstruction. Introduction and Objectives: Our previous retrospective study of primary tracheal tumours in the UK1 showed that very few patients were treated with surgery (in contrast to practice in the USA); although radiotherapy achieved some cures. We therefore attempted a prospective study to define current UK practice and further compare results for surgery and radiotherapy. Because of the rarity of these tumours, only an observational study could be used. Methods: From 1993 respiratory physicians were asked to complete questionnaires for new tracheal tumour patients on first line management and short-term outcome and then to complete follow-up questionnaires until death. From 2001 patients were recruited, with ethical approval, from the BOLD database. Results: 40 patients were recruited (25 men) mean age 59 years (range 19–86). 20 had squamous cell carcinoma, 12 adenoid cystic carcinoma, two small cell, one undifferentiated, one large cell, three rare cell types and in one no histology was obtained. The table shows treatment by cell type. 36 patients have now been followed for at least 5 years or to death. 21 were treated with radiotherapy, 11 with surgery and six had combined treatment. Two had laser resection/stents. 7/21 (33%) radiotherapy patients survived at 5 years and two are alive at <5 years. 6/11 (55%) surgical cases have survived at 5 years and one is alive at <5 years. 3/6 (50%) patients receiving combined treatment are alive at 5 years with one also surviving at <5 years. Patients treated with laser/stents died at 1 and 9 months. Conclusions: Recent reviews2 3 suggest that some 70% of patients have resectable disease but only 33% were considered fit for surgery in this series. Late diagnosis may have contributed to the low resection rate but these patients should be assessed by specialist centres with surgeons experienced in this field. Patients undergoing surgery had better survivals although bias towards the best prognosis patients probably contributed to this result. Nevertheless radiotherapy can still achieve cures. Chest Surg Clin N Am 2003;13:247–56 . Introduction: Worldwide tuberculosis and HIV are the leading infectious causes of mortality and are increasingly linked. Manchester has seen a 227% increase in tuberculosis cases since 1996. A rise in the number of tuberculosis/HIV co-infections has also occurred. Aims: To compare the background, presentation and management of tuberculosis in patients with and without HIV co-infection. Methods: We performed a retrospective case control study of patients managed at one hospital from January 2005 to May 2008. Isolation of Mycoplasma tuberculosis or treatment for a clinical diagnosis of tuberculosis constituted “tuberculosis”. All tuberculosis patients co-infected with HIV (cases) were included. Each was matched for age and completion of treatment with three patients without HIV infection (controls). Data were obtained from hospital, genitourinary medicine and tuberculosis unit records. Results: There were 21 cases and 63 controls. 15 cases and 45 controls had completed treatment. 67% of cases and 60% of controls were aged between 21 and 40 years. 81% of cases were of black African origin and 5% Asian versus 22% and 59%, respectively, of controls (p⩽0.001). 100% of cases had entered the UK within the past 10 years compared with 73% of controls (p = 0.015). Cases were more likely to be single or widowed 71% versus 32% (p = 0.006), less likely to be GP registered, 29% versus 2% (p = 0.001) and more likely to present directly to the A&E, 52% versus 35% (p = 0.023). There was no difference in disease site, pulmonary symptoms (in those with pulmonary disease), or symptom duration, but fever and weight loss were more common in cases (p = 0.044 and p = 0.023). Quadruple therapy was commenced in 97% and 95% of cases and controls. Major side effects occurred in 27% of cases versus 2% of controls (p = 0.012) and cases were treated for longer, 21% >9/12 versus 5% (p = 0.044). Cases were more likely to be admitted to hospital (67% vs 40%; p = 0.037) and spent longer in hospital (median of 21 days vs 13 days). Conclusions: Many differences exist between the two groups of patients in terms of background, presentation and their use of resources. Methods: We reviewed the degree to which the NICE committee considered risks for PAVM patients; the reasons why recommendations for antibiotic prophylaxis were withdrawn for patients with structural heart disease and risk differences between the two groups of patients. Conclusions: We conclude that antibiotic prophylaxis should still be given to PAVM/HHT patients prior to dental procedures and that PAVM patients and their families should pursue strategies to optimise dental hygiene known to reduce the risk of dental bacteraemias.
. Guideline development group. Br Dent J 2008;204555–7.
. Primary determinants of ischaemic stroke/brain abscess risks are independent of severity of pulmonary arteriovenous malformations in hereditary haemorrhagic telangiectasia. Thorax 2008;63:259–66. Introduction: Pulmonary embolism (PE) is frequently suspected and investigated in the acutely breathless patient. Mortality in patients who survive PE can be as high as 18% at 3 months.1 Computed tomographic pulmonary angiography (CTPA) is the recommended initial lung imaging modality in suspected PE2 and has been routinely used as such in our hospital since 2004. A large number of CTPA are performed and may provide valuable additional diagnostic information when PE is excluded. Aims: To ascertain whether there is a difference in laboratory results at presentation and survival at 3 years between patients with and without demonstrable PE on CTPA. To see whether CTPA provided additional diagnostic information in cases in which the presenting chest radiograph was reported as normal. Methods: Data were collected from patients who had CTPA performed at our hospital (872 beds) over a 12-month period from April 2005. Chest radiograph and CTPA reports and laboratory results (D-dimer, troponin T (TnT), C-reactive protein (CRP)) were obtained from our hospital electronic results system. Data were analysed using MS Excel. Conclusions: A large number of CTPA were performed. Overall, 20% of these investigations revealed PE, similar to major studies.3 CTPA provided additional diagnostic information in half of patients who did not have a PE. There were no significant differences in chest film appearances or laboratory results at presentation of suspected PE, suggesting they are poor discriminators for PE. Pre-test probability scores remain the best predictors of PE. Surprisingly, there were no significant differences in all-cause mortality between those with confirmed PE and those without PE at 3 years after the initial presentation with suspected PE.
. Arch Intern Med 1999;159:445–53 . BTS guidelines. Thorax 2003;58:470–84 . Stein, et al. N Engl J Med 354:2317–27. Introduction: The differential diagnosis of paroxysmal breathlessness and wheeze includes vocal cord dysfunction (VCD), either as an alternative or supplemental diagnosis (in asthma for example). The airways clinic at Lancashire Teaching Hospitals offers a dedicated service for the assessment and management of these patients. The aim of this study is to evaluate and report the outcome of this new clinical service. Methods: All suspected VCD patients referred by chest physicians to the specialist speech and language therapist (SLT) between December 2005 and May 2008 were subjects in this retrospective study. Data from SLT and clinicians’ notes were manually extracted and a database generated to include the relevant comorbidities and risk factors, medications, methods of diagnosis and details and outcome of VCD-specific therapy. Results: Forty-eight patients were referred during this period: 75% women, 10% current smokers, mean (range) age 52.4 years (19–81). Patients were diagnosed on the basis of clinical manifestations, with supportive evidence gained at endoscopy in 38% (most commonly abnormal vocal cord apposition during inspiration). Asthma, obstructive nasal diseases and reflux were the most frequent comorbidities among the patients, with frequencies of 63%, 50% and 50%, respectively. 19% had no relevant comorbidities. Over half the asthmatic patients were treated at BTS/SIGN step 3 or higher, with 17% on oral steroids. Patients were treated for mean (SD) 4.5 (3.2) sessions over 4.0 months (2.7). There was a clear symptomatic response to VCD-specific therapy in 60% of patients with a corresponding fall in medication use in 40% of asthmatic patients. Conclusion: We have diagnosed and treated 48 patients over a 30-month period in our airways clinic, with the majority of these showing a clear symptomatic response to therapy. Future work should target optimising diagnostic pathways and improving treatment response in those not helped by current therapeutic interventions. Introduction: Air travel is increasingly affordable and available. Despite clear clinical guidelines on which patients require oxygen supplementation, there are few sources of patient information and a reportedly inconsistent approach from airline companies. To develop a patient information source we investigated the arrangements for requesting supplemental oxygen for medical needs from airlines servicing major UK airports. Method: Information was requested from airline companies servicing UK commercial airports, from their websites, or customer help lines. E-mails were also sent to the appropriate departments within the airline companies. Each attempt consisted of attempting to answer six standard questions: (1) How much does it cost to organise supplementary oxygen? (2) How much notice do you require? (3) What giving devices does the airline provide? (4) Would the patient be able to bring their own oxygen? (5) Do they have any other useful information? (6) What documentation is required from the patient? Results: 42 airlines were contacted. 30 airlines (75%) provided information via the internet or phone call. Of those 30, 20 (66%) were capable of providing some answers by phone and 14 (46.6%) had appropriate information on their websites. Financial costs varied considerably. 17 (56.6%) were able to supply exact details. Eight did not charge and the remainder varied from fixed prices of £36 to £300. One airline charged 150% of a standard ticket fare (see table and fig). 16 (53%) airlines supplied details of notice of carriage. The median time was 2 days (range 0–28). 15 (50%) companies were aware of the procedure for requesting oxygen. 10 had their own medical proforma and five requested a letter from the patient’s general practitioner. Seven (23.3%) airlines contacted were able to supply details of delivery devices available. Of those, five had a range of 2–4 l/min, two had a fixed flow rate of 3 and 4 l/min. Four of these airlines could provide details of oxygen capacity. Seven (23.3%) allowed patients to bring their own oxygen and delivery system (and would not provide oxygen otherwise). Conclusions: Information regarding the carriage of supplementary oxygen is not readily available for patients using commercial airlines in the UK. There exists little standardisation of costs or notice periods. Few commercial airline companies allow patients to supply their own supplemental oxygen. An information leaflet for patients needing supplementary oxygen would be useful. Introduction: Since 2007, oxygen prescribing in the UK has been by home oxygen order forms (HOOF) faxed directly by individual prescribers to an oxygen provider. Prescription categories are short burst (SB), long term oxygen therapy (LTOT) and ambulatory oxygen. We set out to examine how well home oxygen was prescribed in secondary care to adult patients, in the absence of a dedicated oxygen prescription service. Methods: 196 consecutive HOOF over one year were analysed. To ensure the oxygen company could easily install oxygen a number of criteria were defined as of major importance: duration and flow rate of oxygen, patient consent, installation address and, primarily for inpatients, a contact to allow the company access to the property. Results: 196 HOOF generated for 168 patients were examined. 42 HOOF forms (21.4%) had major completion criteria missing as follows: 12 (6.1%) absent consent; 24 (12.2%) absent contact information; 14 (7.1%) did not give concise numerical oxygen prescriptions. Inpatient requests: 65 for next-day installation with 22 (33.8%) missing installation contact details. LTOT and SB daily use showed a large area of overlap. The majority of LTOT was requested for >15 h a day (35 of 50 requests, 70%). SB oxygen prescriptions ranged widely: 79 (58.1%) for <6 h; 25 (18.4%) between >6 h and <15 h; 32 (23.5%) for >15 h. Ambulatory oxygen was requested for 59 (30.1%) patients. There were 91 deaths (53.8%) recorded at time of data collection. Deaths subcategorised by clinical indication: 42 (out of 47, 89.3%) pulmonary malignancy/palliative had died; 11 (out of 22, 50%) interstitial lung disease had died; 17 (out of 50, 34%) chronic obstructive pulmonary disease (COPD) had died; 21 (out of 49, 42.8%) with other conditions had died. See graph of cumulative survival since oxygen prescribed. Conclusions: ( 1) HOOF forms are not “user friendly” or intuitive and common omissions of data can occur that will delay delivery. (2) There is confusion over the terms LTOT and SB, and appropriate flow rates and hours of use. (3) Oxygen requested for palliative care or pulmonary malignancy is likely to be required for a shorter duration compared with COPD. 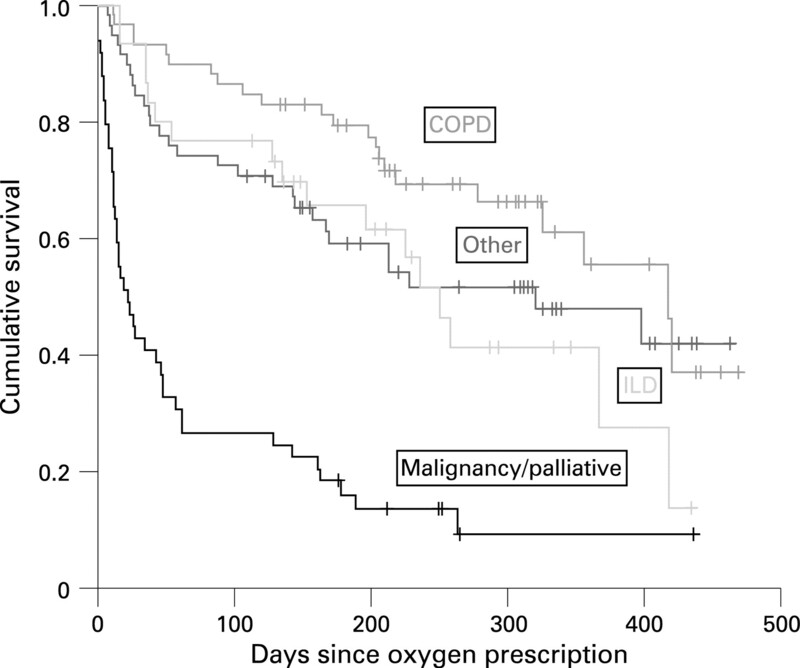 Abstract P38 Figure Cumulative survival since oxygen prescription by condition. Introduction: In 2008 the BTS published the guideline for emergency use of oxygen in adult patients based on target saturations in association with 20 other royal colleges and societies. Oxygen champions have been recruited from hospitals across the UK to help introduce the guideline. An audit tool that can be administered by ward managers has been produced to help monitor the introduction of the guideline and is available on the BTS website. Oxygen champions can coordinate audits within their own hospital and also to contribute to national audit figures. Methods: Emergency oxygen was audited in 522 patients on 22 medical and surgical wards using the BTS audit tool in a pilot site for the guideline. Results: 47 patients; 8.5% were using oxygen; 77% had an oxygen prescription. Oxygen had been signed for on 44% of drug rounds; 93% of oxygen saturations that should have been monitored and recorded on the observation charts were completed. Oxygen saturations were not in the target range at the last observation in 26% (19% too high, 7% too low); the oxygen delivery system had not been changed in any. Nasal cannulas were being used in 74%. Conclusions: Oxygen can be prescribed and monitored successfully using the BTS guideline. Signing for oxygen on the drug chart on each drug round and altering the oxygen delivery system to keep the oxygen saturations within the target range could be improved. This should be emphasised in the training being provided to support the introduction the guideline. Oxygen saturations were often too high suggesting a delay in weaning off oxygen. The guideline recommends nasal cannulae to be used in most patients receiving emergency oxygen and this has been adopted. There was intensive training when the scheme was introduced as a pilot but little subsequent formal training because the guideline was developing. These results should improve with further training that will occur both locally and nationally with the guideline introduction. The BTS audit tool was found to be quick and easy to use and will help monitor the introduction and subsequent adherence to the guideline both locally and nationally. Introduction: Since 2007, oxygen prescribing in the UK has been by home oxygen order forms (HOOF) faxed directly by individual prescribers to an oxygen provider. There are guidelines indicating categories of oxygen use. In Oxfordshire there is no dedicated oxygen assessment service. A variety of primary and secondary care clinicians are prescribing oxygen but often there is no follow-up of oxygen after the initial prescription. This review of home oxygen was to investigate the potential need for a formal oxygen assessment service. Methods: The PCT oxygen bill was used to identify patients. Individuals were contacted by telephone and asked about their actual oxygen use. When a patient’s usage indicated the need for a change, with the patient’s agreement, the oxygen company was sent a HOOF form to change or stop home oxygen. When it was necessary they were assessed at the respiratory unit. Results: 277 patient prescriptions were reviewed over a 9-month period. 16 could not be contacted by telephone. One patient objected to any change based upon the telephone conversation. 15 (5.4%) patients had died but charges were still being incurred for home oxygen. Five (1.8%) patients had moved outside the Oxford region. 28 (10%) patients were assessed as receiving oxygen in line with guidance. The remaining 212 patients had prescriptions changed based on the telephone conversation (see table). Prescription changes resulted in altered charges to the PCT. In 10 patients (4.7%) this daily charge increased. In 186 patients (87.8%) the daily charge was reduced. Additional savings were made from patients who had moved out of the region or died. The total annual saving was £185 664 from the changes. Conclusions: Patients are commonly using less oxygen than is prescribed and had no objection to changing their oxygen order. Poor communication with the oxygen company allows charges to continue when a patient dies or moves away. Over-prescribing of oxygen has a significant financial impact. There are guidelines for oxygen prescribing but they are only specific about LTOT duration and target oxygen partial pressure. The results suggest ambulatory oxygen is commonly prescribed in generous measure.